Question: How is Benghazi different from Watergate and Iran-Contra? The obvious answer: the media. Liberal journalists turned Watergate and Iran-Contra into gigantic national scandals by their consistent, relentless pursuit of both stories; to the contrary, they are consistently, relentlessly ignoring Benghazi. The media's treatment of Watergate needs no explanation here. The press detested Richard Nixon unlike any modern president. Sure, the liberal media went after George W. Bush, but nothing like the way it attacked Richard Nixon. Liberals' hatred of Nixon was pathological. It dated to Nixon's work in exposing Alger Hiss. As Nixon would say at the end of his life, the Hiss-Chambers trial forever forged a legion of unwavering Nixon enemies on the left. I'm not saying that Richard Nixon was an angel, but if you want to understand Watergate, you need to understand the hatred of Nixon by the liberal media. The media's feelings about Ronald Reagan were not quite the same, but nasty nonetheless. Liberal journalists demonized Reagan, calling him everything from an idiot to a nuclear warmonger. They caricatured Reagan as a dawdling old fool who wanted to blow up the world and who disliked the homeless, the poor, minorities, and on and on. They blamed Ragan for everything from greed to AIDS. And they searched diligently for a Watergate-like scandal to run Reagan out of the White House, as they had Nixon. The operative words are "searched diligently." CBS, NBC, ABC, the New York Times, the Washington Post, NPR, and the usual suspects looked everywhere for something -- gee, anything -- to hurt Reagan. Being political partisans first and journalists second, they dug furiously for their Watergate. And they thought they had it in Iran-Contra. It's fascinating, however, to see how the Reagan team immediately reacted to the Iran-Contra allegations. The president and his attorney general wanted prompt and full disclosure. As soon as Attorney General Ed Meese learned of the situation, he brought it to President Reagan, and they together publicly disclosed the details to a hysterical media on November 25, 1986. They wanted to come clean immediately, to avoid even the slightest whiff of a cover up. The media, however, was ferocious in its lack of charity and understanding, and ditto for its party, the Democrats, which ran Congress. In mere weeks, Lawrence Walsh, a former federal judge, was appointed Independent Counsel to determine whether the deal was illegal and which individuals should be prosecuted. 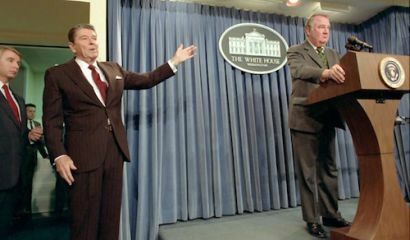 For the press, the big question was the president's personal knowledge and involvement: What did Reagan know? The media wanted Ronald Reagan in handcuffs, and was relishing the prospect of prison terms for a whole host of Reagan officials -- Cap Weinberger, Bud McFarlane, John Poindexter, Ollie North, to name just a few. They wanted blood. There was no way they were going to miss a Watergate opportunity for the Gipper. Congressional Democrats scheduled dramatic hearings, broadcast all day long by the networks. The nation was riveted, especially by the sight of NSC figures like Col. North, testifying in his Marine uniform, and Admiral Poindexter, speaking slowly to glaring interrogators in between pauses to puff his pipe and to listen to whispers from his attorney Brendan Sullivan. The evening news broadcasts provided wall-to-wall coverage. It was relentless. Bill Clark, one of Reagan's closest aides in taking down the USSR, who by this time had returned to his ranch in California, told me about a trip he made to Washington that December 1986, after Iran-Contra broke. He was there for a ceremony honoring his previous work as secretary of the interior. Reporters didn't give a damn about Clark's work at interior. They came and hounded him about Iran-Contra. Wherever the president and his men went, they were tailed and peppered by aggressive reporters who ensured a constant stream of questions about Iran-Contra. It was unceasing -- the complete opposite of what we're seeing now with Obama and crew over Benghazi. And think of how history would have been different if the media had run Reagan out of office: No Berlin Wall speech, no Washington or Moscow Summit, no INF Treaty, and surely no collapse of communism in 1989. Michael Dukakis would have probably won the presidency in 1988. The way the Reagan team reacted to initial reports on Iran-Contra is precisely the opposite of how the Obama team has responded. But even more telling are the opposite media reactions. For Iran-Contra, the media refused to be satisfied with the initial response of Meese and Reagan. Liberal reporters went absolutely bonkers, all hands on deck, a full-court press to find incriminating information. Today, under Obama, it's the exact opposite. What we're witnessing right now is how the media's liberal bias truly works. Liberal journalists can be like men and women possessed when a Republican is in the Oval Office, but for a liberal Democrat, they are as compliant as lambs. Being political partisans first and journalists second, they are now silently complicit when faced with Obama's scandal, one potentially more disturbing than Watergate and Iran-Contra combined. After all, Americans died in Benghazi. For liberals in the media, however, corpses in Libya get in the way of their primary duty: getting Barack Obama reelected. Paul Kengor is professor of political science and executive director of The Center for Vision & Values at Grove City College. He is author of the new book The Communist: Frank Marshall Davis, The Untold Story of Barack Obama’s Mentor. His other books include The Crusader: Ronald Reagan and the Fall of Communism and Dupes: How America’s Adversaries Have Manipulated Progressives for a Century.